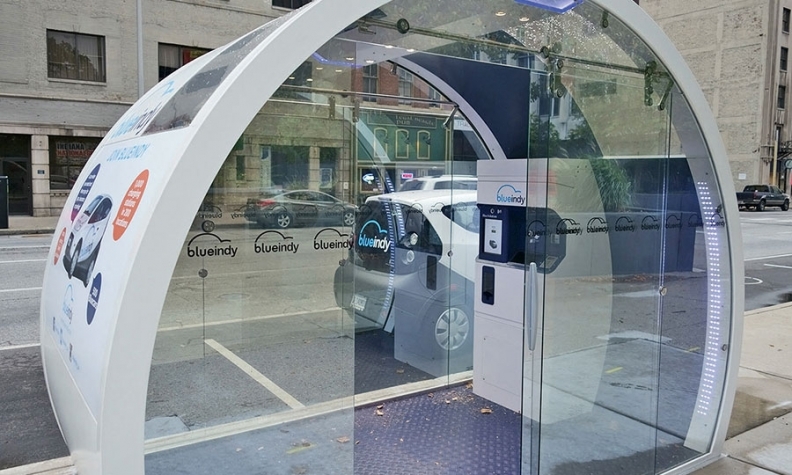 A streetside kiosk for the BlueIndy EV ride-sharing service in Indianapolis. A user swipes a membership card, enters an ID number and receives the number of an available Bluecar. The user then swipes the card on a reader near the driver's side mirror to unlock the car. INDIANAPOLIS -- When the BlueIndy electric vehicle ride-sharing service started operation on Sept. 2 here, Cassie Stockamp wasted little time getting rid of her car. She sold her 2009 Volkswagen CC that day so she could rely on the blue and white BlueIndy cars and her bicycle for her short commutes to work and around the city. Stockamp wistfully describes her CC as a "beautiful car," but she's not losing any sleep now that it's gone. "I'm thrilled not to have the car payment, the insurance, the oil changes, the fill-ups," says Stockamp, who commutes less than five miles daily from her home in the hip SoBro neighborhood north of central Indianapolis to her job downtown as president of the nonprofit Athenaeum Foundation. The nearest Blue-Indy cars are just a few blocks from her house. "We don't have a great mass transit system. That [BlueIndy] was the final piece I needed to sell my car. I really do care about my carbon footprint. That's my biggest motive." 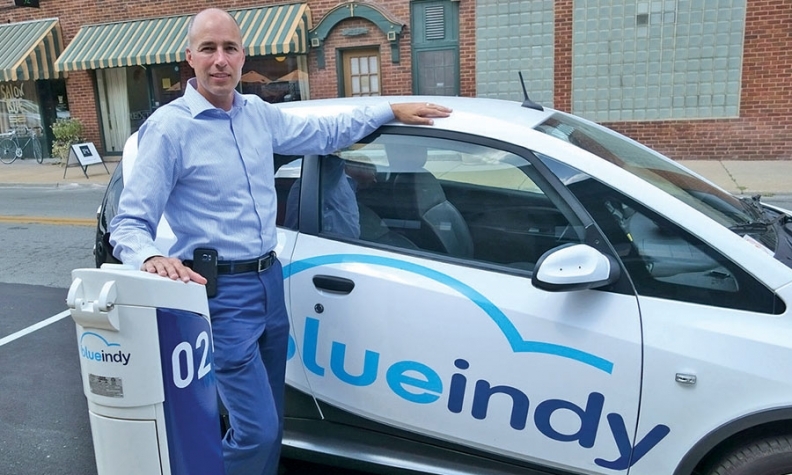 BlueIndy, one of the nation's first municipally supported one-way EV ride-sharing services, eliminates many vehicle ownership hassles including insurance, maintenance, 24/7 roadside assistance, GPS and parking searches. All are courtesy of the city and Bollore Group, the French industrial and energy conglomerate that is investing $41 million to set up and run the service on a 15-year contract. 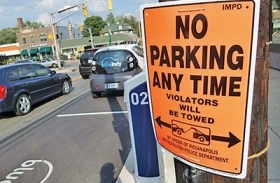 A no-parking sign is posted near parking spaces the city has appropriated for BlueIndy. The mayor has championed the service, but others are highly critical. "It's a service that is perfect for students who can't or don't want to own a car, for empty nesters looking to downsize, for people who need reliable transportation that can't afford car payments and insurance and registration and fuel." In its first few weeks, BlueIndy has signed up more than 500 members. Stockamp took advantage of a half-price introductory offer of $60 for a year. That will give her access to about 1,000 dedicated parking places in 200 locations around town once the service is fully operational next summer. At press time, about 50 cars were operating with 28 parking locations open with five spaces each. The service is scheduled to open in October at Indianapolis International Airport. When that happens, BlueIndy's general manager, Scott Prince, estimates users will spend $10 to drive from the airport to downtown, compared with $45 for taxi fare or $25 for an Uber ride. For users such as Stockamp, BlueIndy offers some bonuses. No matter which of the identical EVs users drive, the car will play her favorite radio stations courtesy of data stored in BlueIndy's central servers. The $60 introductory offer doesn't include use fees of $4 for the first 20 minutes and 20 cents per minute thereafter. Use fees vary depending on whether the user has a weekly, monthly or yearly membership, or is simply using a credit card. Prince says the charges are designed to encourage short-term use with typical trips running less than three hours. To reserve a car, a user with a membership such as Stockamp swipes a membership card on the streetside kiosk and enters an ID number. The kiosk gives the number of an available car. The user locates the car and unlocks it by swiping the membership card on a reader near the driver's side mirror. After unplugging the charging cord and spooling it into the charging kiosk, the user enters the car (the ignition key hangs on a cord from the dash), turns the key twice to start the car and illuminate the instrument panel, releases the hand brake and drives to the BlueIndy station nearest the user's destination. Each charging kiosk has a beacon on top lit in one of three colors: Green means the parking place is available, blue means reserved and red means unavailable. Full charging takes about eight hours, giving the cars a 120-mile range. The fare meter stops running when the car is parked at the station, shifted into neutral with the hand brake set, and the cord from the charging kiosk is plugged into the car. Scott Prince, BlueIndy general manager, says Indianapolis was an ideal city for the French Bollore Group to launch its first U.S. service. With 26 million visitors annually, 60,000 university students and a thriving downtown, the city offers Bollore a chance to show that an electric vehicle ride-sharing service will work in the U.S.
BlueIndy cars have a European feel. Users must set the hand brake before turning the car on and off. Most Americans, except those who drive cars with manual transmissions, are unaccustomed to using a hand brake. The Bollore Bluecars, as they're known, are utilitarian. The motor emits an electronic whine. The ride is firm bordering on rough, which could become an issue on the heavily potholed streets of Indianapolis. Acceleration is reasonably zippy and handling nimble. The Bluecars have four seats and those in the rear can be folded down. The luggage compartment is compact but has space for a couple of suitcases. The cars are assembled in Italy through a partnership with Pininfarina S.p.A. The accompanying infrastructure is developed and manufactured by Bollore Group. The suburban Paris company, founded in 1822, has 55,000 employees worldwide and had $12 billion in sales in 2014. According to Forbes, Chairman Vincent Bollore is the 12th richest person in France. Bollore Group modeled the BlueIndy service on its Autolib ride-sharing service in Paris inaugurated in 2011. After Paris, Bollore launched similar services in Bordeaux and Lyon. This fall, the company plans to launch Bluecity ride-sharing program in London. Cedric Bollore, Vincent's cousin and vice president for development, says the company is looking for more U.S. business. "We are certainly interested in the West Coast," he says, adding that discussions are ongoing with some cities, but he declined to name them. In its four years of operation in Paris, Autolib has become ubiquitous. The system has signed up about 235,000 members taking an average of 15,000 rides a day. Since launch, users have logged more than 10.5 million rides. There are now 3,322 EVs in operation with 977 stations and 5,500 individual charging points. Susan Shaheen, co-director of the Transportation Sustainability Research Center at the University of California, Berkeley, says Indianapolis could provide some key answers about how one-way ride sharing could work outside major metropolitan areas. "One of the questions people are looking at is can these services work in cities of smaller scale?" Shaheen says. "Could they provide the same kind of benefits in cities that don't have the same density or the same kinds of public transportation network?" Bollore aims to find out over the long haul. The company signed the contract with Indianapolis, developed the Bollore Bluecars and the lithium-metal polymer battery that powers them along with the battery management system, the charging infrastructure, membership kiosks, and the in-car communications system with GPS that tells users where to find open parking spaces. The nerve center for BlueIndy, including the dispatch center, is in France. To sign up, users can go online at blue-indy.com or visit a registration kiosk. Paul Mitchell, president of Energy Systems Network, an Indianapolis nonprofit consortium of companies and institutions whose goal is promoting clean energy technology, was hired by Indianapolis to investigate Bollore and the Autolib system. He traveled to Paris in the spring of 2013 to put the system through its paces and came back convinced Bollore's system could work in Indianapolis. "I was blown away by the number of technologies they had integrated," says Mitchell. "I was impressed by the IT systems, back office operations and sturdy charging stations." Mitchell believes the BlueIndy cars are well suited to a new generation that holds different views of vehicle ownership. "The car is an extension of your smartphone. I get in and it says: 'Hello Paul. Here are your radio stations.' That's far more interesting to millennials than a car that's an extension of your personality." That's why programs such as BlueIndy could spell big changes for the auto industry, Mitchell says: "The big OEMs are trying to figure out who is going to buy their cars." Though she's not a millennial, the 50-something Stockamp is one of those people the OEMs might need to worry about. "If I'm going to visit my daughter in Bloomington, I'll use a program called RelayRides," Stockamp says. "It's like an Airbnb for cars. People put their cars in this fleet. I can pay for somebody's car for a day, a week, whatever. It's a shared economy. Do we all need to have the same things, or can we share more?" As it gets up and running, BlueIndy might provide some intriguing answers to her question.